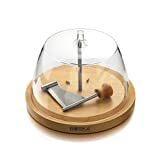 Enjoy fine cheeses like Tete de Moine from Switzerland, Petit Basque, Edam, smoked cheese, and other similar cheeses and even chocolate in a whole new way with this cool new Boska Holland Cheese and Chocolate Curler. With a simple twirl of the stainless steel blade over a hunk of cheese, this unique cheese curler (traditionally known as a girolle) creates continuous paper-thin curls that not only look decorative for serving, the curling effect also helps to aerate the cheese and make its flavor and aroma more intense. It features a Perfect for serving guests cheeses on a board or use the curls to garnish pasta or top a salad. It also works with chocolates as well to create curls for desserts like cakes and ice cream. Available with bases made from either Oak, Beech Wood, Dark Wood, Plastic, or Marble and there's even one with a dome as welll. Size: 9.45" x 8.86" x 2.36"